If you want your content to stand out – and up – in the vast sea of content, you need to create something sufficiently novel and useful. You need to invest in research methods that will put you ahead of the pack. Much of what’s been covered in academic literature hasn’t made it to mainstream audiences because the content is dry or too dense for most. But if you can use the research to create content people can and will want to read, you’ll be a go-to resource on the topic. How to go about researching the peer-reviewed journals? Search for industry terms to see the research published in that time frame. To take things to the next level, familiarize yourself with the way the terminology associated with your industry and relevant fields is covered in academic literature. Use those words and phrases in your searches too. While you shouldn’t rely on it as a primary source, Wikipedia is a good place to learn academic jargon. The “See Also” section at the end of most articles is a good place to look. 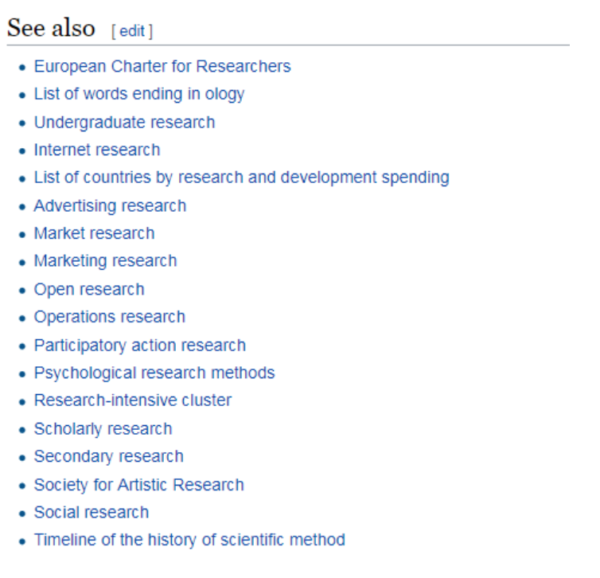 The references at the end of each Wikipedia article are often primary source links that connect to reputable journals. Another good source for information on what is happening in academia is EurekAlert!, which posts press releases about scientific discoveries. 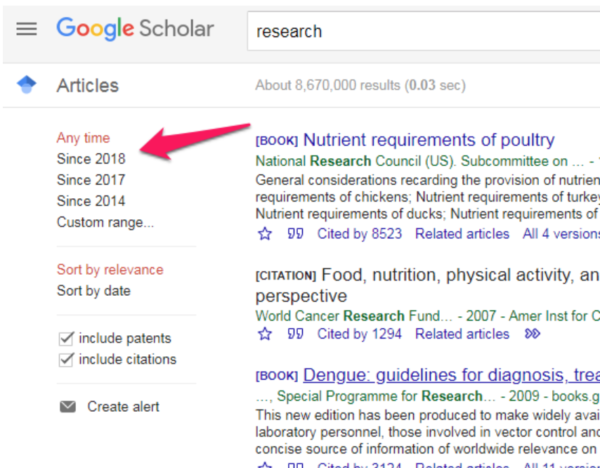 Conducting a “site:eurekalert.org” search in Google and limiting your search to a recent time frame can help you find results that are current for your target keywords and topics. Press releases often mention the name of the study or the lead author and academic institution so you can track it down. While it might seem like any information you find in a book also can be found on the web, books have a lot to offer content creators. Books offer a comprehensive and cohesive take on a subject, in contrast to the disjointed and atomized way you absorb information on the web. Google and social media filters tend to offer information you already know or were expecting to learn, while books can expose you to unexpected ideas. A good book on your subject acts as a lens to view that world, sparking your creativity. As a method of research for content marketing, “investigative journalism” is a phrase that deserves quotation marks since you likely aren’t going to be speaking to the next Edward Snowden or releasing the next Panama Papers. What separates this kind of research is that it places you as an observer or recorder of real-life activities. Think about how you’ll use the interview before you question the expert. Format and platform matter in how you structure the interview. An added benefit of interviewing experts is it can extend your content to the expert’s audience (i.e., influencer marketing). Make sure to create links and tools to help the expert to share the content. As you invite experts to be interviewed, provide context about why you’re asking, what you plan to ask, and how the content will be used. Make sure to personalize the request. It might seem odd to suggest message boards as a good place to do research. You certainly wouldn’t want to cite a message board as a scholarly source. Yet a message board relevant to your industry or categories offers the opportunity to discover questions being asked, the topics covered, and the possible subcultures being developed. Responses given in message boards, while not authoritative themselves, can serve as jumping-off points by providing a foundation you can explore in more depth. White papers or similar content lead magnets offer a value similar to books. They’re different, though, because they’re written for marketing purposes. And that gives you a view into your competitor’s insights and content practices. Coming up with relevant ideas for your content is an ongoing challenge. Don’t be afraid to step outside your comfort zone and peek at what is going on in other industries. Think about tangential topics and look for creative connections between your industry and other subjects. Taking your content to the next level starts by taking your research to the next level. Put in the extra effort and go for the hard sources. Your content quality and quantity will almost certainly improve. Let CMI do the research to help you grow your content marketing skills and improve your programs. Subscribe to our free weekday newsletter. 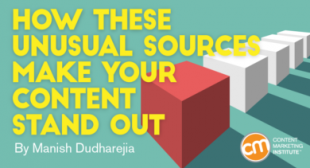 The post How These Unusual Sources Make Your Content Stand Out appeared first on Content Marketing Institute.